I am Sharadha Krishnamoorthy and I work for Invenio Business Solutions, in the UK. I have worked on several technical areas of SAP such as SAP NetWeaver Portal and SAP Process Infrastructure(PO/PI) in the past 13 years. Currently my role is to research the new and upcoming technologies in SAP and create POCs/prototypes for our customers. This is the first blog in a series which will guide you through the steps to design an IoT prototype using some of the powerful services offered by SAP Cloud Platform (Neo). The prototype I have designed is a preliminary prototype for the manufacturing domain. You can create advanced IoT prototypes using the same set of tools (and more) for any industry domain. The diagram(authored by me) below gives an overview of the scenarios which this blog series will cover. I have used the following services of SAP Cloud Platform (Neo). You do not have to pay for any service used in these blogs – they come with the trial version of SCP Neo edition. SAP Cloud platform Internet of Things for the Neo environment – Device management, send/receive data from devices through HTTP. Java application deployed in SAP Cloud Platform – Connects IoT services with Business Rules and Workflow services. SAP Cloud Platform Business Rules – Define business rules to manage the actions depending on the incoming IoT data. 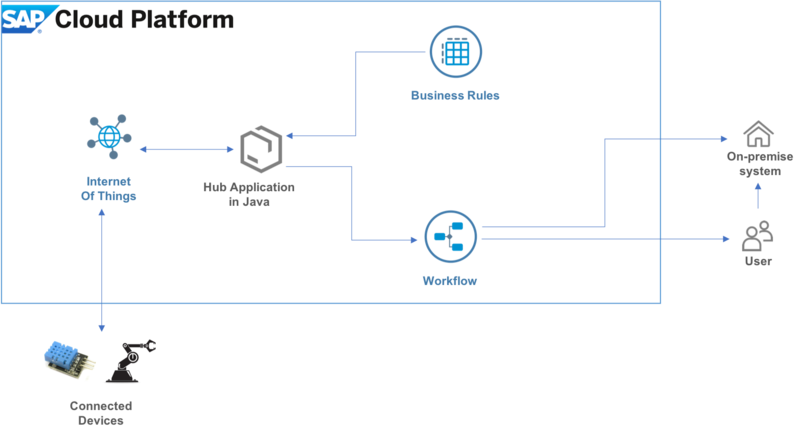 SAP Cloud Platform Workflow – Automate the business process for the collected IoT data. All these services are very intuitive and extremely easy to design, develop and integrated with other services. Note that I am not covering the setting up of Raspberry Pi with the sensors and buttons but will provide the code that I have used to capture and send the data to SCP. There is loads of help available over the internet to set up the Raspberry Pi3 and it is pretty simple. An IoT enabled manufacturing organisation comprises of products, processes and people that are connected together. This blog series will give you an idea of how various services provided by SAP Cloud Platform can be used to connect people and processes with the devices to take informed decisions in real-time. The blog series will cover three simple scenarios. Part 2.1: Remote temperature and humidity control. Part 3: Automated re-ordering based on stock level. Part 4: Controlling the manufacturing process in real time. These scenarios are made more simple in comparison to the real world scenarios but will give you an idea about how the various services in the SAP Cloud Platform can be integrated for an end-to-end IoT application. You can modify or enhance the scenario depending on what you are designing. See you in the next blog with detailed steps for configuring the first scenario. Looking forward to the complete blog series. If you have any questions on Workflow & Business Rules then do let me know. I will be happy to help you. Hi Archana, can you please help Kai who has commented in the part 2.1 of this blog series ? Seems to be an issue with CSRF token. Do we have to use a different URL to fetch the token in case of non-trial development environment ? Anyone knows the status of IOT for NEO? They took that out for a month already without much advance notice. Our organization is trying to evaluate IOT and this is becoming a huge inconvenience. It also doesn’t bode well with the developers who don’t come from SAP background. what is the issue you are facing with IoT on Neo? I am able to access it without any issues. Is it not accessible at all? From how I understand it, existing users are still ok. New users would not be able to register the IOT. I don’t know what SAP is up to. Maybe they want to start charging users on IOT? Even i could not get the IoT Service in Neo Environment.Any update you are having on this?